webertherm XP External Wall Insulation system has been specified for a contemporary new build in a designated conservation area in South West England. The revolutionary system has been used on the walls of the property while weberpral M through-coloured render has been used extensively to long runs of concrete walling. The planning term ‘conservation area’ all too often results in unimaginative new build designs mimicking the surrounding aesthetics rather than offering creative architecture that enhances the area. 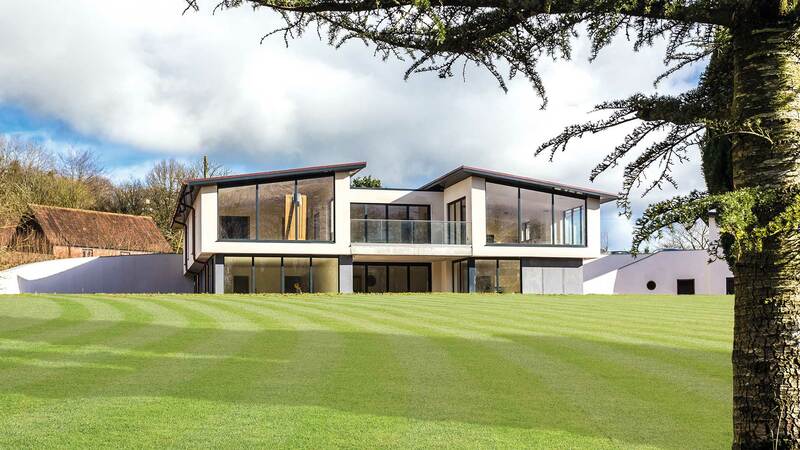 This stunning new home in Somerset illustrates perfectly how architectural flare and modern building techniques are fused to deliver a property that contributes greatly to the local environment. The 430m² private residence has extensive glazing to capture the glorious rural views and to encourage the benefits of maximum natural light. Sleek expanses of webertherm XP EWI with webertherm M1 through-coloured render enhances the profile of the house from all aspects. By embracing the topography of the site, which placed the front entrance at first floor level, and letting the rest of the house flow down to a lower ground floor layout, the house presents a low and softened profile to the onlooker. An enlightened planning approval was achieved for this privately commissioned design by Jason Jackson of Jackson Architects Ltd, Taunton. “An earlier traditional design was not considered suitable by local planners and we were asked to offer alternative designs for this family home. The client was immediately excited about a minimalist and modern design idea and asked us to submit the application. After careful negotiation with the conservation and planning officers, they agreed that the contemporary architectural style of the building would make a highly individual but fitting addition to the very traditional properties in the area. The only significant condition imposed on the planning approval was the removal of the permitted development rights so as to protect the purity of the design! We were really quite amazed and flattered to get this acknowledgement,” smiles Jason Jackson. Matching the dramatic visual appeal of this unique property is the construction formula and advanced thermal efficiency that has been achieved. 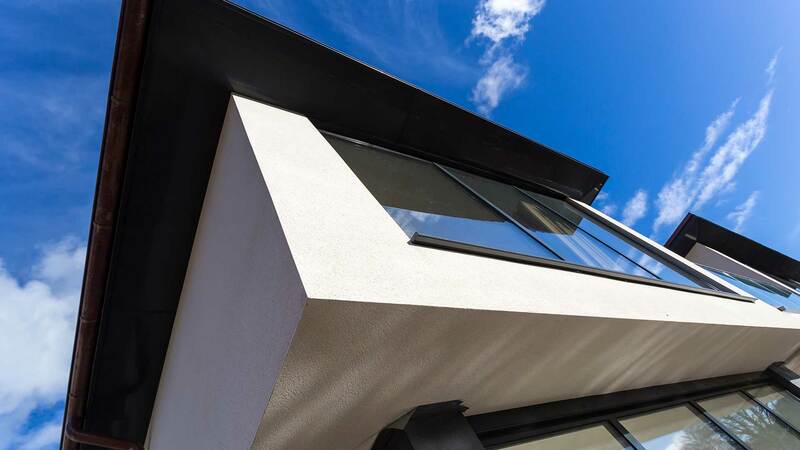 The external walls are constructed as a single skin formed with 215mm thermal blocks that are protected by webertherm XP EWI using 50mm of high performance phenolic insulation. webertherm M1, an advanced one-coat, polymer modified, mineral render, is factory batched and designed for spray application to reduce on-site labour time and access costs and has been used in White. A decorative scraped texture finish has been applied to the White render which catches and holds the light. Mark Pickthall, of M P Plastering, Somerset, carried out the insulation and render application for contractor Fry Developments Limited. 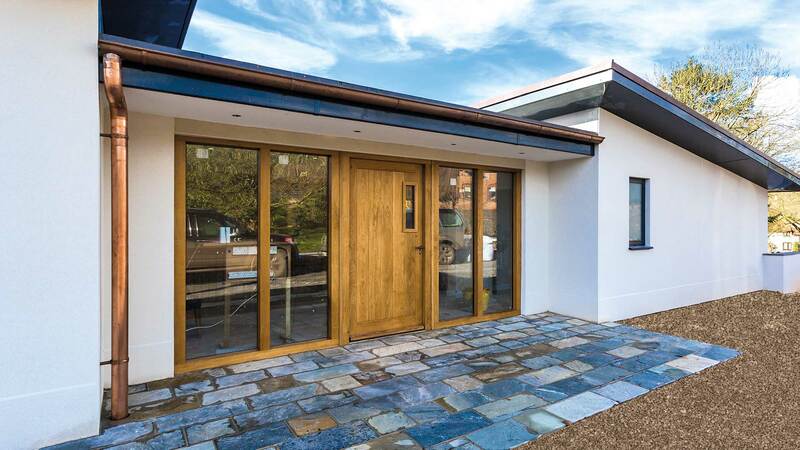 The applicator also specified weberend aid to create a key coat before applying weberpral M through-coloured render, in Chalk, to surface finish long runs of poured concrete walling running from the house to the drive and garage areas. “The superb smart finish of the house structure achieved with the scraped surface of the 250m² of webertherm M1 render really underlines the beautiful architecture of this house which makes a great statement in the locality. We are all pleased to have been part of this exciting project,” reports Mark.